All I can do is to keep writing my notes, hoping that somehow they would grow into texts. "The Book of Spectator" is my attempt to see the theatrical process (phenomena) in dymanic (postmodernist) terms. First, we caqn't really speak of any show and spectors separately (new physics knows it); spectaor is not less a "construction" than the spectacle. If you are to see it as event, both side of it do not exist without each other. The PM writers speak about the "gaze" -- which is the machine of production (also Lacan about "seduction"). We need to read "spectacle-spectator" as a discourse (dialogue), remembering that theatrical event doesn't exist in monologic forms. I don't know what I will do with those spectator's pages! They are somehow between my theory directory and research (virtual theatre). The idea of spectator is the central point, but I'm afraid that, even if I will find time to work on the manuscript, this is more of "theory" or "metaphysics of theatre." "Theory" I understand loosely, according my posrtmodernism interests and I could say the same about the traditional notion of "philosophy" (Nevertheless, I should try to keep the references to the Virilio's theory of accident, Foucault's principles of authorship or "The Logic of Practice" by Pierre Bourdieu). Victor Turner and Richard Schechner prepared the ground for a different view of the theatre phenomena and the field of performance studies gives us a chance to review the fundamentals of dramatic. Only now I began to use SPECTATOR pages for my classes, as a starting point (especially for the low division -- THR200X Aesthetics). Find the ways to connect those three directories: Spectator, Virtual Theatre and Theatre Theory. There must some hierarchy. How to direct to it the traditional directories (Acting, Directing, Drama, Aesthetics)? So the reader could see the philosophy behind it. You probably saw the logo of the Book of Spectator on many of my pages (right) and the simple reason why it's everywhere, because analysis of the each and all subjects in theatre should spring from the phenomena of the Seeing.... In Film, too. Especially, in film. 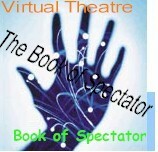 Virtual Theatre places the spectator in the center of any action. Virtual Theatre give you the control of action. Spectator is the next revolution after the Director's Theatre a century ago. Virtual Theatre is the Postmodern Theatre, Theatre of One! It's a theory project, friends. This is another "online" project. I transfer my hard drive files to the web -- and edit them at the same time. I write and publish everything at the same time. To same the time for you, reader. To save money for the publishing houses. Hey, this is Theatre, it has to live! I am a performer! Am I? I know that you are not a reader, you are ... you guess, the Spectator! What do you think this Internet and Web are about? 3. Public: product of the audience. 5. Medium: the site of the imaginary is the ego. To feel unexperienced moments of life (which is to the great extend is life itself). To have (emotionally) what I don't have (and don't want to have for real; like death, for instance). Play with life (sense of life? ), presence of other live life. Spectator: Click to View or Add Links. This writing project is the center of all my textbooks' writing. Acting, Directing, Drama Analysis and even the nonfiction like POV... but I do not work on it! I do not teach such a class (the closest is 200X Aesthetics, the basics). Maybe this is a scholary project and I don't like it. (I wouldn't mind to write it in style of Nietzsche). Theatre Theory: Click to View or Add Links. PLAYS: Click to View Links.